San Jose police last week arrested key members of an alleged South Bay gang investigators say were committing crimes just for fun. Police arrested 12 people, seven adults and five juveniles, they believe would carjack people and rob others just for kicks. The gang was so prevalent, there hasn't been a carjacking in San Jose since the arrests last Wednesday, police said. The gang is responsible for more than 30 carjackings and robberies since last summer, police said, including one at McKee and White roads, where they used an AR-15 assault rifle to take a car by force. In another incident, three members of gang are accused of luring a man looking for an online date to an intersection, then robbing and beating him over the head with a brick. 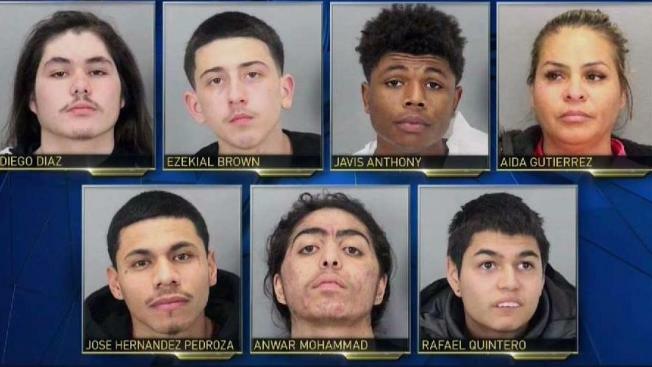 "Their crimes are not restricted to rival gang members," San Jose police Lt. Paul Joseph said. "The people victimized in these cases were just minding their own business." A SWAT team executed a search warrant last Wednesday in the 600 block of Lotus Street, where seven of the alleged gang members were arrested. Police recovered seven guns, cash, a stolen car and other stolen property. "These folks don't claim a particular neighborhood; they're not necessarily feuding with another gang," Joseph said. "But they're clearly an organized group of criminals, acting in concert as a gang." Police believe they have the key members in custody, but they said it remains an open investigation.